Q - FAQ - Suppressor Sights, Taller Sights, Threaded Barrel. How can I have a holster fabricated to accomodate? A - Configure your holster/s as normal by choosing the desired styles and configuration options. During the checkout process, there is an “Order Notes” field. In this field, please make note that you have Suppressor Sights, Taller Sights, and/or a Threaded Barrel, and place a measurement of the height for the front sight post there. Your fabricator will take care of the rest. * Mentioning these options IS ONLY NECESSARY IF THE DEFAULT MODEL DOES NOT COME WITH THEM. Some manufacturers may offer identical models with these variations, or you may have customized your sidearm. 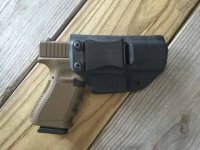 This allows you to customize your new holster to ensure it fits need and preference 100%.